Break a part? Check first to see if it is covered under warranty. If not, you can buy the component at the prices below and be assured of the same quality as the original KIO hexagonal beam. Or, if you are building your own hexagonal beam, we can supply some of the components. The Air Coaxial Center post is made of polished aluminum and stainless steel and has six sets of terminals for a hexagonal beam with up to six bands. The center post fits into the top of the base plate and has an eye bolt on the top for anchoring radial support cords that extend to the ends of the spreader arms. The insulators on the terminals are PTFE for high current and heat resistance. Your 50 ohm coaxial cable connects to a high quality Teflon insulated SO 239 female connector mounted at the top of the center post for an ideal match to the hexagonal beam. Moisture and UV radiation are not a problem with this premium quality center post. The KIO Technology hex beam base plate comes with all U bolts, top center post flange and standard bottom bracket with U bolts for a 1.25 inch O.D. push up mast. The base plate is made of 3/16 inch thick 6061 T6 aircraft grade aluminum and the top flange is magnesium aluminum alloy. The U bolts are made of stainless steel and all other hardware is either aluminum or stainless steel. This baseplate has never failed in service. 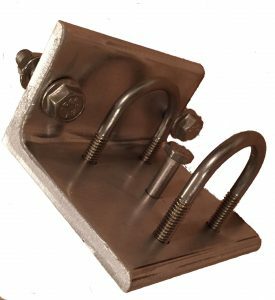 The standard mast bracket assembly on the bottom can be replaced with the Universal Clamp for any mast size from 1.25″ to 2.5″ O.D. 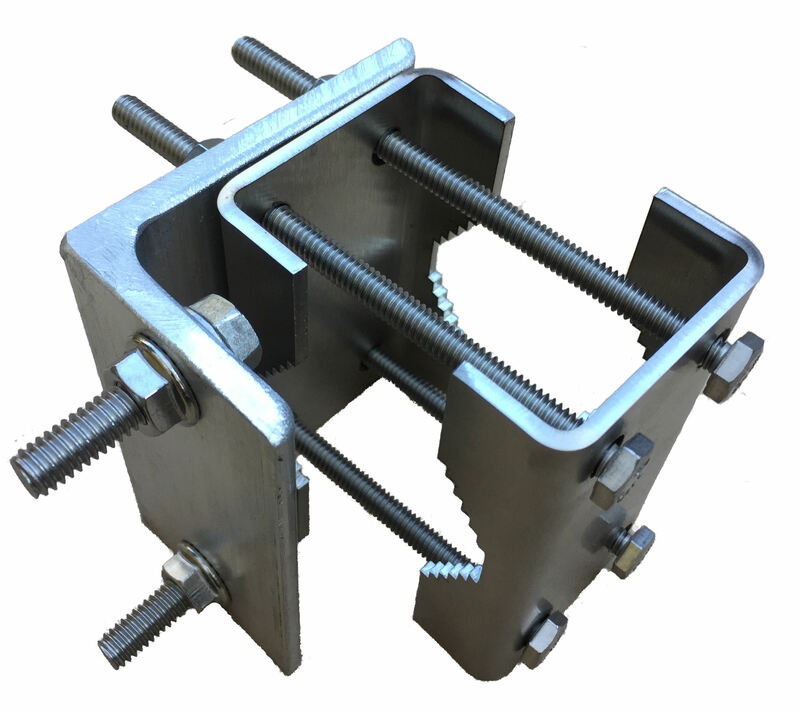 Order the Universal Clamp below. Fit your KIO baseplate on your mast of any size from 1.25″ to 2.5″ O.D. by use of the Universal Clamp here. 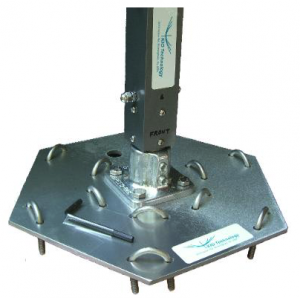 It is made of stainless steel and grips your mast firmly to the bottom of the baseplate. It comes with the bracket, hardware and stainless steel serrated flange bolts for mounting to the KIO base plate, all as shown. The clamp will fit on any KIO baseplate, no matter how old. 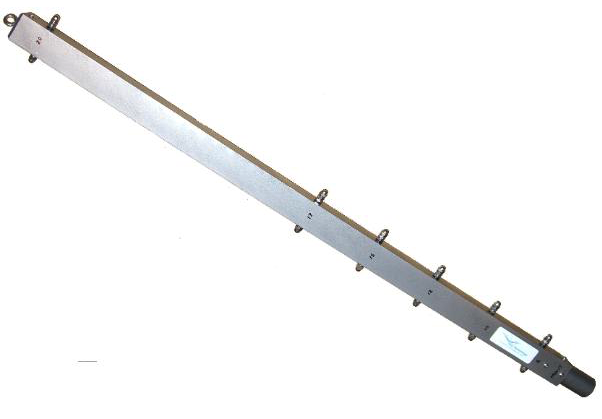 The heavy duty, corrosion free mast bracket for the standard 1.25 inch O.D. push up mast can be installed on the bottom of any KIO base plate, no matter how old. No new holes in the baseplate are needed. Two stainless steel serrated flange bolts and nuts are supplied. This bracket made of 1/4 inch thick 6061 T6 aluminum is a perfect fit for the holes and bolts used on the older style bottom flange base plate. The U-bolts are stainless steel. A pinning bolt is included. Attachments included, ready to install. The support cords are 128 inches each with fixtures on the ends for pulling the hexagonal beam spreader arms up into its characteristic inverted umbrella shape. The cords are made of stretch free Kevlar with a Dacron cover for UV protection and are rated for 700 pounds break strength. Each hexagonal beam requires seven cords; six radial cords plus one perimeter cord. Each attachment includes one rubber coated, aluminum P clip and one stainless steel clamp. If you are looking for ice cords, add band kits or ferrite bead baluns, check the main Store page. We use PayPal to process your order but you do not have to be a member of PayPal to make a payment. Your regular major credit card will work fine. Just click the PayPal button in the Cart above when you are ready to check out.